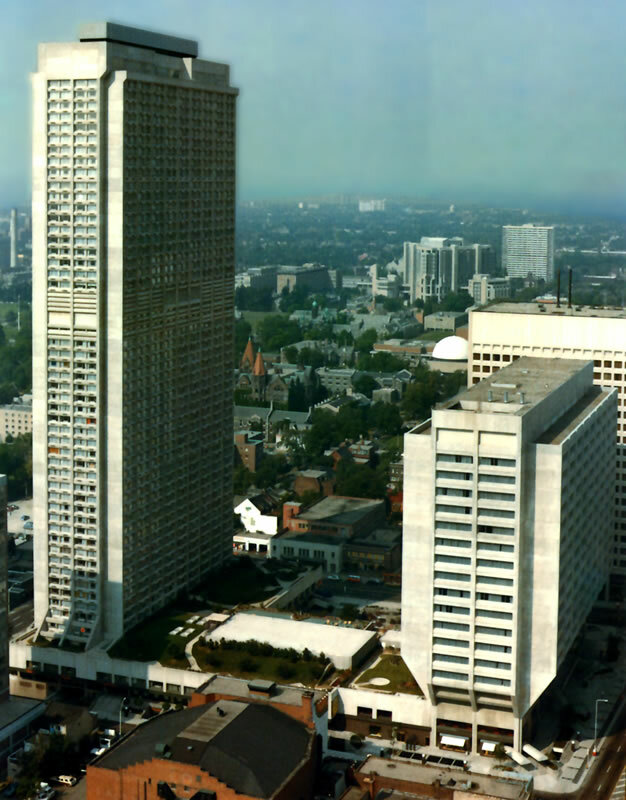 This was one of the first multi use complexes built in downtown Toronto, combining a fifty-one storey residential tower, and a nineteen storey office block, over a three level shopping centre, with a three level subgrade parking garage underlying the entire complex. The residential tower is the tallest reinforced concrete apartment building in Canada, and employs reinforced semi-lightweight concrete slabs and reinforced concrete shear walls. The walls are founded on individual footings bearing on 12 ton soil. Welded wire mats were used as the main slab reinforcing. To achieve the splayed out expression of the office block floors, from the third to the fifth floor level, a bonded post-tensioned system was employed. All of the superstructures are clad in precast panels with glazing in aluminum frames. To reduce the time of the working cycle, on a floor of the residential tower, from five to three days, such items as precast stairwells, colour-coded wire fabric reinforcing mats and preglazed precast wall panels were shipped to the site ready for installation. These innovations along with the use of two and one-half cubic yard magnesium buckets for placing the semilightweight concrete enabled the structure to be completed in record time.